America's obsession with the 50's is no where more obvious than the recent proliferation of 50 style diners and hamburger restaurants. There are more 50's style restaurants now than there were in the 1950's, and Dr. Meat and I have dined at most of them. 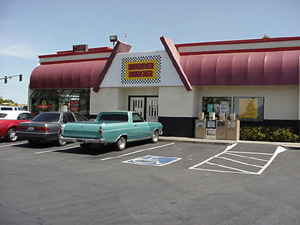 This era was without a doubt the "Golden Age" for the cheeseburger and fries. Mass, cheap refrigeration was at its infancy. Hamburgers were still hand pressed, potatoes were sliced on a wooded cutting boards, buns were cooked at local bakeries, and the lettuce was pulled off of full heads delivered that morning. There were no diet sodas, and Cokes were poured from an icy cold bottles. Teens twisted to jukeboxes tunes from Bill Haley and the Comets, Patti Page and Elvis Presley. Joseph McCarthy was protecting us from Stalin's evil red cloud, and Chevy and Ford ruled the roads. No where else does Dr. Meat feel more comfortable than this 50's motif. I felt like Ralph Ellison's invisible man watching Meat order our meal at Murder Burger. With his hair greased up into a mountainous jelly roll and a pack of smokes rolled up on the sleeve of his turquoise bowling shirt, his body did a white man's jerk as the screams of Mega Kill blasted from the wall speakers. He was oblivious to the wide mouth stares his checked pants and white leather matching shoes and belt received. If it hadn't happened many times before, I would have melted away in embarrassment when he pulled out his nickel-plated, Wal-Mart money clip stuffed with folded food stamps. Murder Burger serves much more than burgers and could be a dining spot for families with a variety of food preferences. They have a menu with a plethora of sandwiches, hot dogs, and burgers. Deep fried vegetables, fish, fruity shakes and ice cream could also be ordered by the non-beef eaters. Normally, their cheeseburger comes loaded with a bucket of mayo and mustard, so mine was ordered 50's style, with 1,000 Island Dressing. I got my 1,000 Island Dressing - poured on top of the lake of mayo and mustard. When I made my first bit, a pickle road a wave of thick liquid onto the table and floor. The rest of the condiments included a pithy tomato, shredded iceberg lettuce, and a slice of red onion. The patty was a big, fried, dry and unseasoned piece of fresh ground beef. It had the potential for greatness but lacked any flavor. A few shakes from the salt and pepper shaker would have made a world of difference. The only thing I could taste was the bizarre mix of dressings which even covered up the flavor from the mountain of gooey melted cheddar cheese. The bun was a fresh, toasted, sesame seed Kaiser roll. The fries were outstanding -- fresh-cut, hot and piled high. These skin-on spuds were not greasy and had a nice potato flavor which would not be recognized by many of our young readers. They were eaten without catsup and were the highlight of the meal. With some fine tuning and quality control, this could be one of the area's finest burgers. Reluctantly I walked into the Davis establishment known as Murder Burger. I say, "reluctantly", because the Davis Aggies have been touting this burger ever since I was an undergrad at CSU Sacto. If there is one thing a Hornet cannot take is another source of "braggery" from our brothers in Yolo county. In other words, the only thing worse than a boasting Aggie is loud mouth Chico Alum (fortunately they don't have "the web" or a great burger there yet). Lucky for me I did not have to travel to the west to give this burger a go, they put in a second store at the former DQ on Sierra College Blvd. The store is a full frontal assault on your vision; black and white NASCAR border, red, gray and blue vinyl booths (I felt I was in a boat interior), and most hideous vision was the dreaded Pepsi fountain (the thought of "dimple girl" is gut wretching). We ordered at the counter, once we got the Counter Mensa's attention, and we were lulled into a state of frantic anxiety by the music. I think it was Cannibal Corpses doing their timeless rendition of Die, Die, Before I Kill You. It was then I noticed the menu offerings of the Killer Dog, Sierra Slammer, Murder Burger, and the Mud Slide. Apparently the whole violence theme is a big seller in the wholesome burg of Davis. When we got our food delivered to our table my tune changed a bit, this was one attractive sandwich. It was piled high, it was hot, and it had one of those fancy toothpicks to hold this monster together. As a requisite I tore off a piece of the meat and sampled the chef's artistry and I have to tell you it tasted just like ground meat. There was no spice, no seasoning, just that bland flavor of recently fried ground beef. Biting into the beast was a different story, first there was gross mushy tomatoes that had more sand than a local beach, then there was the shreds of iceberg lettuce (blah), and finally a toasted sesame seed "Wonder" bun. This was one very mediocre burger. At $6.25, including very good fries, I think a burger patron could do a lot better. I had to think about the poor Davisites for they think this is one of the best, when in reality it is just an over priced Denny's burger, I shed a tear. Maybe they should rename it "Suicide Burger", because that's all this eater could think about after paying for such an over-rated nothing.